Maudslay is a place of connection between the made world and the world of nature; a place that can be a playground as well as a space to contemplate the beauties of the natural world. 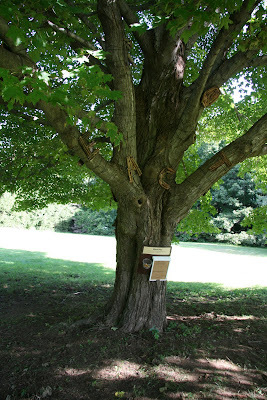 Word Play brings letters and a word game to the observation of this magnificent maple. Stand under the spreading branches and find 22 letters which can be unscrambled to form five words (3,6,2,4,7 letters) that are a quotation from William Wordsworth about nature. Yesterday we installed Word Play at Maudslay State Park in Newburyport, MA. It was one of those wonderful times when the final result looked as good as I had hoped. It was the culmination of a long process. The site was chosen and the plans submitted in May. Then, of course, instead of working on it through the summer, I waited until less than two weeks before to start. I purchased what are called drops, small pieces left over from cutting down larger sheets, of 28 gauge galvanized metal and a pair of snips at Port Sheet Metal and left with instructions from Sandy on how to avoid injury. I managed to complete the twenty-two letters (first cut from paper using some of my old calligraphy teaching handouts as a guide) without a scratch but with a sore hand. Cutting metal is certainly not like cutting paper. I spray painted the letters brown. I gathered sticks, bark, and pine cones and to attach to the letters. I made holes with an awl and then wired the materials on. I hadn't given any thought to time when I made my original plans and it took way longer than I expected. Was my family surprised? Of course not. The final stage came on Sunday. My husband was in charge of the installation. We had several ideas for getting the letters onto the tree (his favorite one, using a screw gun, was not allowed) and happily found that tying black coated wire around the tree did a great job holding the letters in place. My daughter came along and happily assisted by climbing the tree as well as from the ladder and learned how to tie a square knot. If you are in the area, please come by Maudslay. There are 35 sculptures in the park and a catalog available to guide you through. A reception and tour will take place on Saturday, September 19 from 2-5 pm. Find out more about Outdoor Sculpture at Maudslay here. Find the unscrambled quotation from William Wordsworth in this free pdf. I love to follow your work and wish you had a followers gadget so that I'd never miss a single post. I love this tree. What a clever idea. Thanks for all your inspiration. In the navbar at the top of the page, it says Follow Blog. If you click there it will open a window that gives you a choice of whether you want to follow it privately or anonymously. Once you do that you should get notice of new postings on your blogger dashboard. Thanks for your interest. Glad you enjoyed the tree. It's such a wonderful time to be in Maudslay and I love the way the sculptures encourage us to see it all anew.